31 Days of Halloween '17 - Day 3 - "Stephen King's It"
I'm so glad I gave this movie another rewatch because it left a much bigger impression on me than it had before, mainly because this viewing was after listening to the audiobook. I think this really helped me to appreciate just how much the TV movie deals with. 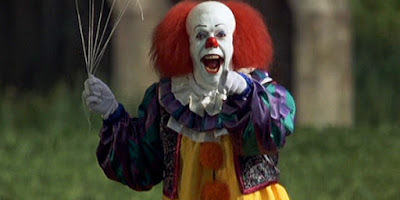 And while I don't think that Curry is the same type of terrifying presence that Skarsgard's Pennywise brought to the table, he's still creepy in an interesting way. I think one of the aspects that sells Curry's Pennywise so well is the reaction of the adults to him. They are all terrified and act like he is the most bone-chilling thing they've ever been unfortunate enough to witness. It can be a little over the top at times but having all the actors treat him as such a threat really presented him as such, even without him really doing such horrendous things on camera (most the deaths are off-screen/done by the deadlights). The biggest issue with the film, and one that makes me a little worried about Chapter 2, is that the story drags a lot when it comes to being with the adults. That side of the story just isn't as interesting to me and the confrontation with Pennywise isn't nearly as satisfying. It just makes me even happier that they didn't try to do it for the new film.